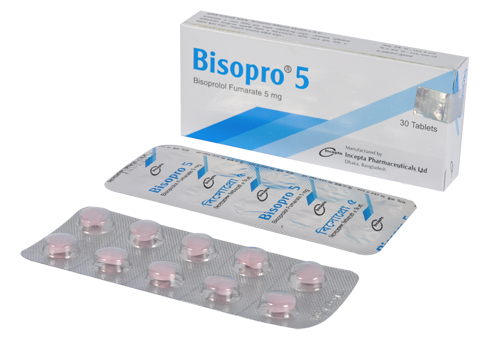 Bisopro 2.5 : Each tablet contains Bisoprolol Fumarate USP 2.5 mg.
Bisopro 5 : Each tablet contains Bisoprolol Fumarate USP 5 mg.
Bisoprolol is a beta1-selective (cardioselective) adrenoceptor blocking agent without significant membrane stabilizing activity or intrinsic sympathomimetic activity in its therapeutic dosage range. 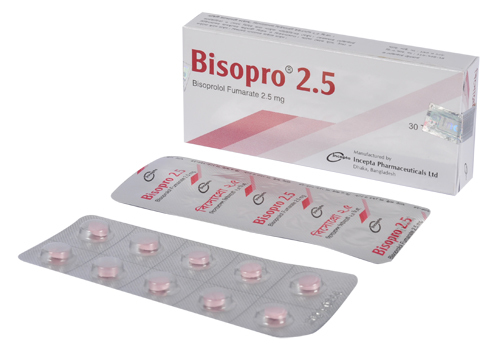 Bisoprolol is indicated in the treatment of hypertension, angina and heart failure. It may be used alone or in combination with other antihypertensive agents. The usual starting dose is 5 mg once daily. In some patients, 2.5 mg may be an appropriate starting dose. If the antihypertensive effect of 5 mg is inadequate, the dose may be increased to 10 mg and then, if necessary, to 20 mg once daily. For heart failure: Initially 1.25 mg once daily (in the morning) for 1 week then, if well tolerated, increased to 2.5 mg once daily for 1 week, then 3.75 mg once daily for 1 week, then 5 mg once daily for 4 weeks, then 7.5 mg once daily for 4 weeks, then 10 mg once daily; max. 10 mg daily. Diarrhoea, dizziness, drowsiness, fatigue, headache, lightheadedness, nausea, sleeplessness, unusual tiredness, weakness, Severe allergic reactions (rash, hives, itching, difficulty breathing, tightness in the chest, swelling of the mouth, face, lips, or tongue), chest pain, difficulty breathing, lightheadedness or dizziness when rising from a lying or sitting position, very slow heartbeat. Pregnancy Category C. There are no adequate and well-controlled studies in pregnant women. Bisoprolol should be used during pregnancy only if the potential benefit justifies the potential risk to the fetus.